The Pz.Kpfw. VI Ausf. B (H) (or Tiger II (H)) is a rank IV German heavy tank with a battle rating of 6.7 (AB/RB/SB). It was introduced during the Closed Beta Test for Ground Forces before Update 1.41. The Tiger II (H) remains one of the more potent foes a player could face in the Rank IV battles. 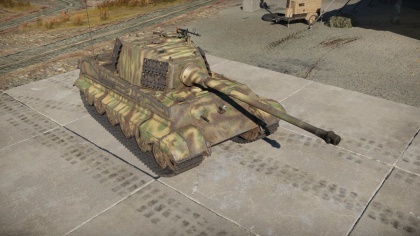 The Tiger II's cannon can maintain a very nice penetration even at long ranges (1200m-1800m) while American and Soviet cannons usually can not keep such high penetration over distance, so they prefer 700m or less engagements where their guns will most likely destroy you in the first hit, so get used to long range engagements. Being comfortable with kilometer long shots is a must in this tank. At 800m you should still be within a safe distance (depending on what you are facing) but going under that is getting into the Allied guns' effective range. The "Henschel" turret is slightly more resistant since it has a flat but thick plate in the front and a more effective gun mantlet. The "Porsche" turret is less armoured, has an exposed turret ring and a shot trap that can and will deflect shells to the weaker upper plate of the chassis. Commander's cupola on the "Henschel" turret is also thicker (150 mm, opposed to 100 mm on "Porsche" turret). Other than that both tanks are identical, but for obvious reasons the "Henschel" turret is more popular than the "Porsche" turret. The initial design is often misleadingly called the "Porsche" turret due to the belief that it was designed by Porsche for their prototype; in fact it was the initial Krupp design for both prototypes. Commander's cupola on top of the turret is 150 mm thick, and quite well angled. Lower glacis is only 100 mm thick, but it is not a weakspot (over 200 mm effective angled). Machine gun port could be marked as small close-range weakspot. Although most of it is still 150 mm thick, the angling is much worse. Some part of the turret side have track links on them, which gives an additional 30 mm of protection to the armour. A 30 mm turret ring plate is present. Belly armour front part is 40 mm thick while the rest is 25 mm thick. The Tiger II (H) is best used at mid to long ranges, where its' small weak spots are hardest to hit. It can, however, be put to work on the front lines, protecting medium tanks and tank destroyers - just be aware of your limited mobility, and ensure you have options should you get advanced upon by multiple enemies. When used as a sniper, it is best that you find a position with a good overview of the battlefield. Keep your tank positioned directly towards the enemy and keep an eye out for any medium tanks trying to flank you (Tiger II has great frontal armour, do not be afraid to use it. However, keep in mind that the lower plate offers less protection and penetrations can easily cause fires due to the positioning of mechanical parts). It is best that you find cover behind a solid object and slightly rotate your vehicle e.g. : rotate your tank about 10-15 degrees from the enemy (your turret too). Positioning, combined with distance, can easily give you effective armour greater than 300 mm. When "sniping" it is best to wait for the enemy to expose their weak points, fire a steady, accurate shot and retreat to a safe position. Wait for your reload to be completed and slowly show your frontal plate (most of the players will engage even though the chances of penetration are low); once the enemy has fired, you can take your time and engage the tank while they reload. Using the Tiger II to advance and to support the front line can be rather tricky. While this tank offers great firepower and superior frontal armour, you'll notice that it is hard to fight in urban areas. In situations like this, you will quickly realize that the high weight and sheer size of the tank can cause major problems. Almost any tank that is faster will easily outmaneouver the Tiger II and destroy it. To avoid this, it is best to stay in the back (not too far from your team), keeping your tank positioned at an angle and using "peek-a-boo" techniques. You should always look for a position that can protect you during the assault of small tanks, such as "U" shaped buildings where you can easily retreat and protect your weak points. Note that you have to find a tactic that suits your play style best; these are simple tips that should help you get started. This is a very heavy tank with an engine meant for a tank half its weight, so it moves slow and turns slow. It is not as reliable for close range combat as a medium tank and if you try brawl with it more than necessary you will find yourself quickly flanked by faster, more agile tanks and destroyed with side/rear shots. Also, soviet 122mm guns don't have the best penetration but if that shell gets into your tank you will not survive, and under 500m, it is going to get in. This does not mean you should stay put in a single spot, or camp a location like a tank destroyer (which are designed to camp): you have mobility, so keep moving or you will attract a lot of attention, only to find out too late that someone took his sweet time to travel 1.5km to your position to deliver you a shell to the side. This is very important as your survivability will dramatically increase if you carry the ammo you need and not all you can. It is mostly a matter of luck but if an enemy hits you where he knows there's an ammo rack and this ammo rack happens to be empty, you will probably end up with a few knocked out crewmen instead of a pyrotechnic display. Most people will try to shoot the turret first, so reduce your ammunition count to 49 out of 77 to remove all the ammo racks in the turret to explode far less often. Each subsequent ammo rack can removed by reducing the count by 14. 49 shells (empty turret) is too much for an arcade battle, but is more than enough for a simulator/realistic battle and is the recommended amount for it. You can reduce your ammunition count further if you feel like it. For example, carrying 27 shells to an arcade game is the bare minimum for a quick and action packed arcade battle, that equals to five full ammo racks and one shell in the cannon. See Ammo rack section in specifications for more details. Knowing what your gun and ammunition are capable of is very important; this translates into knowing what kind of ammo to use in every situation against any enemy tank. Like most German tanks, the stock APCBC (PzGr 39/43) is a good all-around shell, effective at close and long range with good penetration and good fragmentation, it will be the one you will be using the most. For close range combat with very heavily armoured tanks you will need APCR shells (PzGr 40/43), its high penetration value at close range can be a threat even to some 8.0 BR tanks, but remember it is a solid shell with no explosive charge, so you will need to aim carefully for crew and vital components which means you will need to know where these are located exactly. The recommended ammo ratio is 2/3 (two thirds) of APCBC and 1/3 (one third) of APCR. Your "target size" is the length or the width (depending on what side you are facing) of your target, the mils are displayed in your sights on the horizontal axis, you divide these 2 numbers and multiply the result by 1000 and you will get the exact distance in meters. Then you just have to adjust your aim using the vertical axis of your sights (that displays the bullet drop) and take the shot. If your numbers were correct, you will land the shot right on. This applies to all tanks in all honesty, you need to spend some time looking at the armour of any tank you might encounter and learning where possible weak spots are located and under what conditions (angle, distance) you can actually score a good hit; yes, the gun is extremely good, but don't expect miracles, aim it right and it will serve you right. Learning your enemies' reload rates, vital components and crew locations is also very important; if you learn where their ammunition is stored, you will be creating fireworks during the whole game. Take care of reading about your enemy's different ammo options, remember that just looking at the penetration values under the short description is not enough, since most tanks will have better options when it comes to ammunition. Learn under what conditions (angle, distance) your tank is safe from all the available ammo for these certain tanks, then take measures to protect yourself. Ensuring sufficient cover is available is very important for the Tiger II; if you happen to find a position where a piece of rubble covers your lower frontal hull plate you have just made yourself near indestructible from the front. You can also use some low profile friendly tank destroyers, providing there is suitable clearance to fire over them. If you try to move ahead in the face of an enemy you will end with a disabled transmission, a fire and possibly some knocked out crew members, or just destroyed. Explore the map, find places where craters, depressions in the ground, soft hills, rubble, rocks or artificial obstacles (such as trenches) will cover you while letting you shoot over it; the Tiger II has very nice gun depression, use it to your advantage. Remember that destructible environmental objects (like brick walls, fences, and even trees) will protect you from a single HEAT or HE shell hit, but nothing else, and you should not rely on it to cover your sides or as anything else than visual cover. Taking cover behind large rocks, hills, buildings or even ally heavy tanks while you perform repairs or reload can be very useful. Any competent enemy will avoid regular AP rounds when engaging at long range; HEAT, some APDS, and high-calibre HE rounds are all capable of doing damage even at extreme ranges. Ensure you account for the capabilities of what you're engaging; tank destroyers such as the ISU-152 can easily destroy your vehicle with their extremely high-calibre HE rounds, HESH such as that fired by the FV-4005 can also be deadly, and HEAT rounds when uptiered into tanks such as the M46 can effectively penetrate your upper plate even at range. Additionally, well aimed APDS rounds from British tanks such as the Centurion and Conqueror are capable of penetrating, even at range. Avoid exposing any more of your vehicle than absolutely necessary; with the impressive gun depression of the Tiger II (H) you should easily be able to make use of any available defilade or ridge that can protect your hull. Lone heavy tanks are vulnerable heavy tanks, so it's always best to ensure you've got some support around when advancing or holding a strategic location. In close-quarters maps, where short to mid range engagements are the best you can hope for, try to be the front-liner, taking the shots you'll survive that your medium tank allies might not. They, in turn, should be able to assist you if enemies attempt to flank. Remember, however, that you're not invulnerable and it's not your job to save teammates that make mistakes. You should assume the worst about anything you encounter, too - tanks such as the T34, IS-2, etc can all easily destroy you at close ranges, so being efficient on your shots is extremely important - avoid panicking and giving tanks that can engage you comfortably a chance to fire back. Often, you'll have no choice but to engage in close quarters. It's far from ideal for a Tiger II, but it's still reasonably doable. As mentioned previously, avoid exposing your LFP, make use of any cover available, while maintaining a small amount of angling on your hull to maximise the effectiveness of the UFP. Avoid exposing the sides of your turret at all costs! Do not angle more than a few degrees either side to avoid the thin armour on the sides of the turret being penetrated. Try to ensure you have some sort of escape route handy if things go sour - something preferably that you can cover with smoke to give you time to repair if necessary. Attempt to set up ambushes where possible, using choke points and intersections where you will get the first shot reliably and enemies are unlikely to be able to react in time to save themselves. Driving a recently unlocked tank is always difficult; the gun accuracy is terrible and the inability to repair in combat is extremely frustrating... but nothing is worse than feeling powerless to stop your tank from burning to a crisp, even after defeating the enemy that caused the fire. In general any vehicle will underperform when stock, so don't say "I hate it" before you unlock all the modifications. Only true effort can unlock the necessary modifications to remedy this - or golden eagles (but let's assume you have more important things to buy with your golden eagles). You cannot repair anything else than your tracks. Once you catch fire, it is game over. All your research points should be prioritized into the Parts modifications. This modifications is number one priority. Stay in, or close by the capture circles. Did you know that you can repair and replenish your ammo storage at the capture circles? No? Well, now you know it. Use this knowledge to your advantage. If you get your gun shot, you can repair without the Parts modification by stopping your tank inside the capture zone. If you get your transmission or engine shot, and somehow you don't catch a fire and happen to be near a capture zone, you can ask one of your allies to tow you to the capture zone. Remember that you must press the acceleration key (default: W) when someone is towing you, as it will unlock your brakes making you easier to move. Avoid exposing anything that might risk fire at all costs. If you do catch alight, it's game over. Make sure to deal as much damage as possible if you do happen to catch fire. Adjustment of Fire: Significantly increases the general accuracy of your main weapon. Particularly noticeable when firing at long range. Tracks: Notable increase to the manoeuvrability of your vehicle. Particularly valuable in close-range maps. Help your allies, and they might help you. Help out allies where possible - act as a shield for damage tanks, assist your squadmates in repairing, provide suppressing fire where possible, help stuck vehicles out. By helping them out, you're not only likely securing your own assistance when needed, but you're also helping your team win the game - which, in the end, is the main objective. 3.0/10 Rusher: Trying to get to the cap point before a T-44 or a Panther? Keep dreaming. This is a slow slumbering beast that will struggle to achieve 40km/h even on a flat road, struggle to achieve 30km/h on flat cross country, struggle to achieve 20km/h on rough cross country and struggle to achieve 8km/h up a steep hill (that is, if you can climb it at all). Its engine was meant for a tank half its weight and size, so expect a slow tank. 4.5/10 brawler: Its heavy weight, limited acceleration and high profile make it unsuitable for highly mobile close quarter battles, if the tank is on its own it will get easily flanked and destroyed by faster medium/light tanks better suited for these battles and most Allied tanks prefer close quarters while engaging the Tiger II, so it quickly becomes a turkey hunt. However, its great gun and heavy frontal armour add to its survivability and if the operator has medium tank support it can become a foothold for the team. 6.0/10 flanker: Again, its high profile and low acceleration don't make it the best tank to flank and a medium tank is better suited for this, but it has a fairly good top speed (even if it takes a long time and a flat road to achieve it), its comparatively fast for a heavy tank, its heavy armour gives it extra survivability in case of a counter attack and if it manages to position itself on the enemy's flank, it can quickly reduce them to pyrotechnics. 7.4/10 Adamant: Its heavy frontal armour will often serve as a shield to your lighter allies, you will be capable taking heavy hits and shrug off impacts that most medium tanks can not take, it has some flaws and weak spots in the frontal armour that the enemy will take advantage of, but with some angling and planning this can be mitigated. Its side armour is, however, very weak. 7.6/10 Sniper: Distance is this tank's friend, its gun has a very long effective range and its armour becomes impervious to most enemy weapons at long ranges, but not all of them and it is not by any means a tank destroyer which will have the upper hand over the Tiger II at very long ranges. 9.0/10 Ambusher: Be it sitting still at the end of a street or waiting in the river while the enemy approaches the bridge, this tank will shoot 3 times or more before the enemy even realize what hit them, but you need to be accurate to be dangerous and having support and/or a place to fall back to or a hull-down position is essential for an ambush. The Tigers' common enemies are going to be the M26 Pershing, an agile american medium tank with a 90mm gun that can pierce some holes in your frontal armour from a medium range and can get in your flank in no time, but however has relatively thin armour; the T32, a heavier version of the Pershing with an impenetrable mantlet and nigh invulnerable upper glacis, and a far nastier version of that 90mm gun; the premium T28, american tank destroyer with incredibly strong frontal armour and a gun far superior to the Tiger II's (shoot the cupolas), the premium M26E1 and the Premium M46 "Tiger" American tanks which have very similar guns to the Tiger II. A further nuisance is the M41A1 Bulldog. While it will mostly only fire sub-calibre shells, these are a danger up to 1000m to the frontal turret armour. Experienced light tank drivers will try to flank the Tiger to get shots into the exposed hull ammo racks, the APDS shot usually setting these off with one shot, unlike the APCR the Bulldog also carries. If you are stuck in close quarters, try to get a shot off as fast as possible in order to immobilise or destroy it. T95: Use your medium tank to either outflank this enemy or put a few well aimed shots into the cupolas. Watch out for its traverse speed, as the Doom-turtle is shockingly fast to turn on the spot. T29: Very good gun, penetrations are very deadly. Surprisingly resistant despite its weak hull armour, multiple shots will be necessary if you don't have a lucky shot. From the front, if you have the patience and finesse, a shot into the turret front to the right of the gun mantle will most likely result in an ammo rack. The IS-2_(1944) is a soviet heavy tank with a large 122 mm cannon that you want to stay away from. Both HE and APHE shells of the 122 mm cannon pose a threat and the turret armour can be quite trollish, often either bouncing shots or sometimes eating them up. Succeding the T-34-85 is the T-44, a sneakier and more armoured version of the former. It retains the excellent mobility while gaining better manoeuvrability and hull armour. Luckily it retains the 85mm, which however is quite enough to reliably deal with the Tiger's sides. Deal with them quickly before you need to turn the turret and expose you tank's weak side to the enemy. Like with the IS-2 the best place to shoot the T-44 is the turret and lower glacis, the T-44 also inheriting the bouncy turret, so aim well! SU-100: Fast, mobile and armed with a gun rivaling that of your own tank, this tank destroyer is not to be underestimated. It can punch holes through your turret with ease. 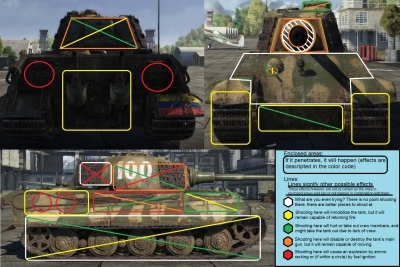 Fortunately they have little yet well angled armour, thus SU-100 drivers will often angle their armour to create areas of high angle equivalent to auto-bounce zones. In such cases aim for the less angled portion, side or front. All three variants of the ISU series are big boxy targets with very nasty guns, yet are sluggish and have no angled armour. Look and sneeze at them, however often enough they will wait in ambush situations, so be prepared! T-54 is rare but will still pop up in matches. If you have the time against them at close range, shoot at the turret front. At medium distances you will need APCR or a very lucky shot. British vehicles are some of the first to get APDS (The first being the A34 Comet at BR 5.3), and are therefore very dangerous due to their high penetration. The Tiger II will commonly face tanks like the FV4202, Caernarvon and the Centurion Mk 3, all of which have the 84 mm 20-pdr gun. They can punch straight through your turret cheeks at long range with great accuracy. They also have sloped armour, which may bounce some of your shells if you aim poorly. You may also face tanks like the A39 Tortoise, which is a very difficult penetrate from the front. It has thick, sloped armour and a high penetrating 94 mm 32-pdr gun. At long range even your powerful 88 mm will struggle to take one out. You may also face tanks armed with the 105 mm L7A1 gun, like the Centurion Mk 10. Tanks with this gun have massive penetration (over 300 mm) and so you will be an easy target for them. Luckily, most British tanks do not have explosive filler in their rounds. They will easily be able to take out your gunners/commander, but will struggle to knock out the driver from the front. This will give you the chance to use the tanks decent reverse speed to make your escape. This is true in a literal and figurative way, if you keep telling yourself that you can't do it you won't do it. This tank is not easy to operate and it can be frustrating at times but it is a very good tank once you start using it properly and keep its limits and weaknesses in mind. In the literal way, yes, your worst possible enemy is another Panzerkampfwagen Tiger Ausf. B. They know the tank from the inside out just like you, long range and even taking cover wont help you since they have that same amazing gun and they know exactly where to hit, besides, when talking about distance: if you can hurt it, it can hurt you, and if it can't hurt you, you can't hurt it. A Tiger II vs Tiger II fight usually ends in less than 25 seconds, sometimes lasting as little as 2 seconds using 2 shells or less to achieve the destruction of one of them. Sometimes you will find yourself exchanging shells for a whole game. The only effective way to face a Tiger II with a Tiger II is to hit first and making sure the hit has a crippling effect on its firing capability (hitting the turret from the front for example, taking out the gunner and commander and possibly hitting ammo). 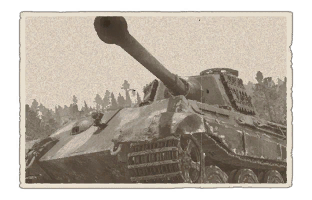 If you happen to get hit like this from a Tiger II your only hope is to get to cover in less than 10 seconds (weapon reload time with an expert crew, maxed out loader and commander is 10.6 seconds) and run away to a safe location to repair since these hits will most likely destroy your turret ring and cannon breach. You will be engaging the Tiger II with your Tiger II in arcade games for the most part, but also in realistic/simulator squadron battles where it is a very popular tank. Remember to read "how to destroy a Tiger II" below, there are more tips available on this topic there. Colour-frames showing the viability of targets on the Königstiger. A Tiger II is a formidable enemy when its used correctly by its operator, but its by no means indestructible under any conditions. The first thing you want to do is deny the Tiger II of the advantage of its gun by getting as close as possible while keeping clear of its cannon (the closer you get, the better the penetration values for you and the Tiger II) most Tiger II operators will avoid getting flanked at all costs so you might find yourself forced to face one from the front. The biggest weak spot is the lower frontal hull plate, its slopped but only 100mm thick and behind it lies the transmission that likes to catch fires and create nasty shrapnel when destroyed, the shrapnel will fly inwards and if your shell is large enough they will take out the entire crew. However, this shot will most likely only leave the Tiger II unable to move for a minute and make his operator quite angry (at you) while his gun remains perfectly operational and before you have a chance reload you will most likely receive a very accurate shot from an irritated Tiger II operator. The lower frontal plate is a good place to hit but it should be a second option, with this tank, you need to disable that gun as soon as possible, the turret is a very reliable target at close range, even with HEAT ammo you should be able to deliver a shot that will disable its firing capability for long enough for you to reload and shoot again. Using your best AP round for this is recommended since the frontal turret has a fairly thick (but flat) plate, if nothing else works try APCR. Using high caliber HE rounds is also effective. The cupola is probably the best place to hit with an HE shell, since the explosion will deflect into the thin upper plate and destroy everything inside. It is not easy to hit, but if you manage to hit the cupola its very unlikely it survives. The Tiger II is very vulnerable to "Circling attacks", that means, running around it in circles and harass it with side shots. Its turret can turn quite fast (specially in arcade mode) but most medium tanks are fast enough to outrun it. With the turret face being 185mm thick and some tracks lining the sides, the Tiger II(H) has a much better turret than its predecessor. Like all other Tiger II's, the frontal hull armour is still extremely thick. Nearly impossible for anything but APDS and HEAT to punch through the upper glacis plate. As will all tanks bearing the name Tiger, side scraping is still a good tactic to use on the battlefield. 40 mm roof armour offers decent protection against lower-caliber air attacks and even artillery. Even if and enemy shell does goes through the lower glacis plate, the Tiger II's transmission sometimes acts as a buffer. This can lead to completely unharmed crew. Even at a BR of 6.7, Tiger II's KwK43 88mm cannon is still great. It scores high marks in penetration, accuracy, damage, and fire rate. Arguably the best gun at Rank 4. Decent gun depression of -8 degrees can have the tank utilize hull-down tactics to protect lower glacis. Stock PzGr 39/43 shells are still the go to anti-tank round. Great accuracy, penetration, and damage potential. Fully upgraded, the Tiger II(H) has a high top speed and quick traversing turret. This will give you a fighting chance against medium and light tanks trying to flank. Even when the turret is empty of ammunition, the Tiger II can still hold and impressive 48 shells. Running out of ammo is rarely an issue. Good reverse speed to withdraw from disadvantageous situations. Despite having a better turret than its predecessor, the overall turret armour of the Tiger II(H) is sub-par for the Rank. Nearly every tank the Tiger II can meet in battle can punch right through the turret sides and face. This is a really big tank. Difficult to miss, even at long range. Long and large gun barrel makes it easy to be spotted and damaged to prevent usage. The lower glacis plate is only 100mm thick. Expect to lose the transmission, driver, and co-driver every so often. With ammunition lining both sides of the hull, shells that penetrate either side are extremely dangerous. HEAT shells are inadequate to penetrate armour at this BR, might as well not bring any. Carrying any more than 48 shells can prove fatal since ammo will stored in the back of the turret. Even when fully upgraded, the engine power is underwhelming for a tank that weighs 68 tons. This tank takes time to reach its top speed and struggles to climb hills. While fast in a straight line, the Tiger II's maneuverability at low speeds is poor. Enemy mediums can take advantage of this. 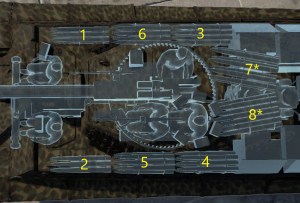 This tank can be matched with tanks that have a 7.7 BR. Every tank in that BR bracket are post-war vehicles that have access to APDS or HEAT shells. Just before the Tiger I entered service in 1942, work has already begun for its successor. In 1937, Henschel was ordered to develop a heavy tank design, with Porsche following suit in 1939. Porsche developed their new heavy tank off of the failed VK 4501 (P), churning out two models designated VK 4502 (P) named Type 180 and 181. The Type 180 had its turret mounted centrally while 181 had the turret mounted on the rear with the engine in the center (akin to the Ferdinand tank destroyer layout). Both designs used the same components of the VK 4501 (P) and both designs were visually similar except for the turret locations and some mechanical parts, but these two designs never passed wooden prototypes. Henschel, on the other hand, used a more conventional design in their tank layout, but the end result look no way similar to their previous heavy tank design Tiger I. The VK 4503 (H) as designated by them resembled a Panther tank layout, with the transmission in the front along with the driving compartment, the turret in the center, and the engine in the rear. The design used many components from the Panther and the Panther II in order to standardize production. The suspension system was also different from anything produced at the time, though still using a torsion-bar suspension, the wheels were arranged only in the overlapping method, not interleaving. This new Schachtellaufwerk design simplified maintenance and increased production by using less wheels than interleaved (only 9 each side) and with full-steel wheels that the later Tiger I models used to save rubber. The first wooden mock-up of the design was presented on October 20, 1943 to Hitler, to which it was approved for further development as the Panzerkampfwagen Tiger Ausf. B, or just Tiger II and Tiger B for short. The Henschel variant was more advantageous than the Porsche variant for being developed faster and has a faster production rate, thus it was destined to be approved for service. The Henschel design began production in the Henschel plant at Kassal and the first 3 working prototypes were churned out in December 1943. Full-scale production began on January 1944 and continued all the way until March 1945. Due to the late introduction and the amount of resources needed to construct the heavy tanks, only about 482 production models were produced in this time period, considerably less than its predecessor, Tiger I. The Tiger II is just massive in size. Weighing in at 68.5 tons, it is the heaviest tank to see service in World War II, beaten out as heaviest serving vehicle by the Jagdtiger, which weighs 71.7 tons. The Tiger II front armour is 150 mm thick, and this is without sloping, with which it would be more than 200 mm thick in effective. The thick front glacis armour was never penetrated by any Allied tank throughout the entire war. The side and rear armour is still 80 mm, which presented a weaker target, but still formidable at longer ranges. The gun on the Tiger II was the famous 8.8 cm KwK 43, which could defeat all Allied armour in World War II. The gun is sighted by the gunner with a Turmzielfernrohr 9d monocular sight that allows two magnifications, 2.5x and 5x. In practice, the gun is able to hit a target under 1 kilometers away 100% of the time. The turret on this Tiger II is the production turret model by Krupp, colloquially known as the "Henschel" turret (hence the "H" in the name) despite that the Henschel company had no influence on the Krupp turret design. This turret replaced the flawed prototype "Porsche" turret, also by Krupp. The production model was a simplified turret, using more flat surfaces and a sleeker shape for easier production. The previously curved front of the turret is made into a thickened flat face that presents no shot trap and the protruding commander's cupola was flattened into the design. The turret is powered and could rotate under two settings, high and low. In low, the turret could be rotated a full 360 degrees in 60 seconds, and the same in 19 seconds at high. Though the engine could allow the turret to traverse in 10 seconds in full power, but this was not recommended to avoid straining the engine. The turret traverse is powered by pedals or a lever by the gunner and is fine enough with these methods that small adjustments with the manual traverse hand wheels are not necessary. The Tiger II was still propelled by the V-12 Maybach HL230 gasoline engine, which powered the lighter Panther and Tiger I. The increased weight of the tank made the engine under-powered, requiring extra care to make sure the engine does not fail. Despite that, the tank was capable of reaching a maximum speed of 41.5 kilometers per hour, making the Tiger II quite agile for its weight. However, the Tiger II consumes exorbitant amount of fuel and requires extensive maintenance to keep running, which impedes its combat effectiveness in the whole strategic view point as it only had an operational range of about 120 kilometer per hour on cross country terrain. The heavy weight also causes multiple mechanical issues in the tank, the drive train is overburdened as it was intended for a lighter vehicle and multiple breakdowns were experienced in early Tiger II models. Though, these issues were ironed out over time with improvements, but still persist due to lack of supplies to maintain the tanks. The Tiger II is organized into heavy tank battalions (Schwere Panzer Abteilungen) in the Wehrmacht and SS units, who first received them by February 1944. A standard battalion would have 45 Tiger IIs, with three in command and 14 in each of the three companies. A total of 14 battalions were employed during World War II in the Heer and SS, 11 assigned to the Heers and 3 to the SS. The original role of heavy tank battalions was to engage, breakthrough and destroy enemy armour on the offensive, but the changing war situation saw their role relegated to the defensive. The Tiger II's first recorded combat action was in the 1st Company of 503rd Heavy Panzer Battalion in Normandy in July 1944, fighting back the Canadians during their offensive in Operation Atlantic, three Tiger IIs were lost, two from combat and one from becoming irrecoverable after falling into a bomb crater. However, by the end of the Normandy Campaign, all of the Tiger IIs in the 503rd were lost. The 501st Heavy Panzer Battalion had the Tiger II see first action in the Eastern Front on August 1944, where it resisted the Soviet Lvov-Sandomierz Offensive. It was here on the road to Oględów in August 12, 1944 that an ambush by a few T-34-85s destroyed three Tiger IIs easily and some more disabled. The destroyed Tiger IIs were attributed to ammunition explosions. Due to this incident, it was ordered that the crew do not store the cannon ammunition in the turret, though the enforcement of this order varies between units. Still, 16 Tiger IIs in the 501st became disabled or destroyed in a span of more than two weeks. The Tiger II also played a part in Operation Panzerfaust, where the 503rd Battalion were stationed in Hungary to ensure it stays in the Axis Alliance. These tanks stayed for 166 days and claimed a large number of Soviet vehicle kills for the loss of 25 Tiger IIs. The Tiger II continued to see action in most of the offensive and defensive actions in the last few months of World War II, such as in the Ardennes Offensive in December 1944, the Soviet Vistula-Oder and East Prussian Offensives in January 1945, and the German Lake Balaton Offensive in March 1945, Battle of the Seelow Heights in April 1945, and the Battle of Berlin that lasted until VE Day. The Tiger II's performance in battle was quite favorable in firepower and achieved a disproportionate kill-loss ratio. The 503rd SS Battalion claimed 500 kills for the loss of 45 Tiger IIs in the time span of January to April 1945. However, most of the Tiger II's losses were due to mechanical breakdowns or lack of fuel, so the crew abandoned these tanks and destroyed them to avoid enemy capture. Ultimately, however, while these tanks proved a menace in the battlefield, its overall strategic effect to the war is negligible like its predecessor due to low number available. Today, there are 10 Tiger IIs in varying conditions left in the world. The most well known is the one at Musée des Blindés museum at Samur, France. This Tiger II is the only working version left in the world, this variant has the "Henschel" turret attached. Other notable places around the world that has the Tiger II is at the Bovington Tank Museum at England (which has a Porsche and a Henschel variant), Kubinka Tank Museum at Russia, and the (future) National Armor and Cavalry Museum in America. Camouflages and skins for the Tiger B (H) from live.warthunder.com. #tiger_ii The entirety fo Tiger B skins, but containing Porsche turret versions too. Lookout for the boxy turret for the correct camouflage. Page of the Bovington Tank Museum on the "Sd Kfz 182 Panzerkampfwagen VI Ausf B (E1952.33)"
Text of this page was written for the Wiki competition "Combat training" by Remiak Link to original contest entry article. This page was last edited on 12 April 2019, at 03:49.